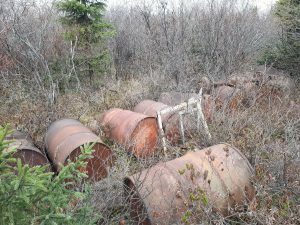 The twentieth century environmental practices of a number of industries and problems associated with the remote locations of some regions have resulted in a legacy of abandoned sites in traditional Innu and Naskapi territory. Since there are no longer owners of theses forgotten sites, it is hard to establish polluter responsibility. Yet these sites are at the heart of traditional territory and the contamination of natural resources has an impact on the people who use the territory. In 2017-2018, the FNQLSDI started a soil mapping inventory of abandoned sites in traditional Innu (Nitassinan) and Naskapi territory. The purpose of this inventory is to establish an action plan to restore the abandoned sites identified. The project, to take place in three phases, will be implemented over the next three years.